It’s already been a few weeks now since I’ve taken this baby out for a spin, but I still wanted to write it up in a post of it’s own. I’ve only ever owned a Suzuki M800, and only a few times have I swapped bikes with colleagues or friends. 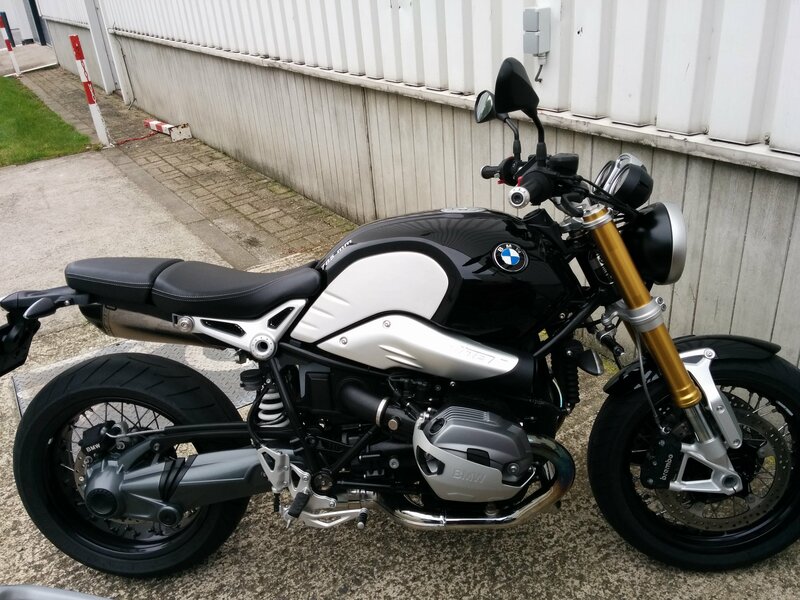 So this won’t be an expert comparison review on the BMW R Nine T, but just my personal experience. I’ve always thought that the next bike I’d buy would be a Harley Davidson Breakout, or a Night Rod Special, but I might have to step down from that. This R Nine T is just amazing. It looks great, it rides fantastic. There is A LOT of power at low rpm, and still you feel you are in absolute control. The few times I’ve ridden other motorcycles, it took me a while to adjust to the power curve, either I kept stalling it because I didn’t rev it up high enough, or I had troubles with selecting the correct gear. Not with this one, the power is there from the low rpm, all the way up to the highs, which gives for a very comfortable feeling. The little tug to the right the bike give you when you rev it up at standstill, because of the boxer motor and shaft drive, I was warned about before I got on. I was a bit surprised that it was this pronounced, but it’s not noticeable when riding. It’s just a great feeling to have. The one thing that did strike me odd was that it felt amazing heavy to steer around tight corners. I’m used to my M800 being very light around the corners, although a lot of people assume it must feel really heavy, just because the bike looks heavy. I guess that I’ve been using all counter steering on the Suzuki, the handlebars are very wide, giving me a big lever to push against. So with minimal effort to guide her through the bends. Now with the R Nine T, that kind of steering was a lot harder. I guess that I should lean into the curve more on a bike like that, something that doesn’t have any (or just a little) effect on the Suzuki. I’ll have it to give it another try sometime next year, when the motorcycle season starts again.